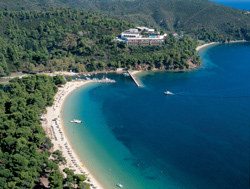 Nestled in a pine forest, the Skiathos Palace Hotel is built on a hillside com manding splendid views over the famous Koukounaries Bay at the southwest corner of Skiathos Island. 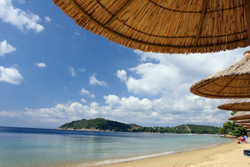 Conveniently located at a short walk from the beautiful sandy beach, 10km from bustling Skiathos town and 12km from the airport, this fine establishment is the ideal destination for unforgettable and relaxing holidays. 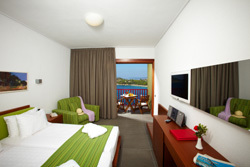 The Skiathos Palace Hotel offers a wide variety of accommodation with 258 comfortable guestrooms. Each guestroom is appointed with a private balcony, private bath/shower, direct dial phone, internet access, Satellite TV, three-channel music, fully stock ed mini bar, twice daily maid service and air condition. Executive rooms and suites feature large terraces with sun beds, offering pa no ramic sea vistas over the Aegean Sea and Kou kou naries Bay. The hotel’s facilities include a mini market, car/motorbikerental, safe boxes, currency ex - change, Wi-Fi access and internet hot spot, swimming pool, tennis court, massage and courtesy room, laundry service, baby sitting (upon request) and children’s playground. Umbrellas and sun-beds are available by the pool. The main restaurant serves American breakfast buffet, a-la-carte menu and the best of both European and Greek cuisine as dinner. 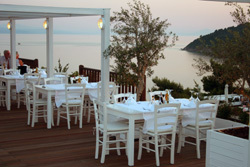 The roof top grill restaurant "The White View" is ideal for dinner offering magnificent views of the open sea. The Pool Bar and "Maratha Beach Bar" serve snacks and refreshments. 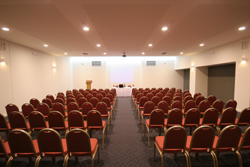 The hotel boasts conference and banqueting facilities ideal for those who want to combine fun and relaxation with creative and organised conferences. 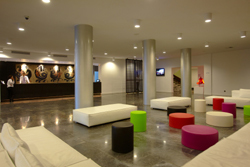 Equipped with contemporary audiovisual systems, the five conference rooms can accommodate up to 1.100 persons.